Did you just hear that ruckus? 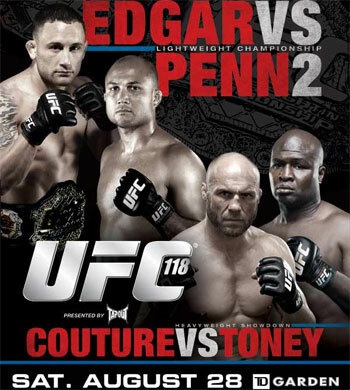 That was gambleholics across the globe rejoicing because “UFC 118: Edgar vs. Penn 2″ will be jumping off in just two days. After witnessing a couple of underdogs come in at Saturday’s “Strikeforce: Houston” event, betters have been itching for their next shot at some longshot lovin’. If Frankie Edgar didn’t feel disrespected before, then the UFC lightweight champ surely has the right to feel that way now. The Gambling Gods have spoken and they believe the Jersey boy is one-and-done as the 155-pound Octagon king. Despite entering their UFC 112 contest a 5-to-1 underdog, Edgar used his superior speed and quickness to upset Penn for his strap in Abu Dhabi. Edgar will only be a 2.5-to-1 ‘dog in his mulligan against the Hawaiian. For the first time since this line was posted, the powers that be have just released the Over/Under for rounds. It appears the 155-pounders are expected to go beyond 3.5 stanzas. It’s no surprise the early money is on Randy Couture to successfully ruin James Toney’s mixed martial arts debut. However, “The Natural” was at -700 earlier this week, so it will be interesting to see how this line continues to move as Saturday approaches. UFC 118 takes place this Saturday inside the TD Garden in Beantown.